Phenylalanine Fluorometric Assay Kit | K572 | BioVision, Inc. 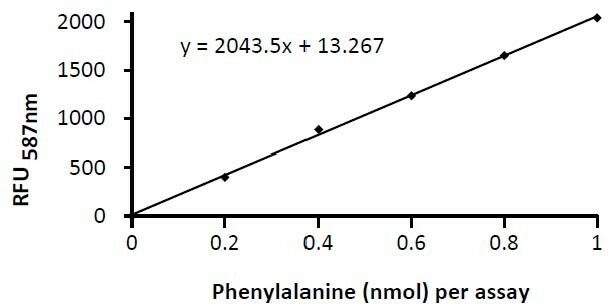 The assay is linear in the range from 0.1 to 1.0 nmol (2-20 µM) of Phenylalanine. L-Phenylalanine (PHE) is an electrically-neutral amino acid, one of the twenty common and one of the three aromatic amino acids used to biochemically form proteins. Phenylalanine uses the same active transport channel as tryptophan to cross the blood-brain barrier, and, in large quantities, interferes with the production of serotonin. Errors in PHE metabolism lead to phenylketonuria or PKU which can have dire consequences. BioVision’s Phenylalanine Assay Kit provides a quick, simple, accurate method for quantifying PHE in biological samples. In the assay, PHE is reductively deaminated with the simultaneous formation of NADH which reacts with our fluorescent probe to generate fluorescence at Ex/Em=535/587 nm. The assay is linear in the range from 0.1 to 1.0 nmol (2-20 µM) of Phenylalanine. High concentration of NADH, NADPH and Tyrosine can interfere with the assay causing high background. Do we need to deproteinize our samples? "Deproteinization helps remove proteins/enzymes which can degrade/use-up phenylalanine. Deproteinization can be done by Biovision kit K808 (acid precipitation method) or by centrifugation through spin filter columns (cat#1997). The 10 KDa mol wt cut off ensures all higher molecular weight proteins/enzymes are removed from the sample and the flow through contains small molecules only. The maximum loading volume for the spin filter columns is 500 ul and the stop volume is 20-25 ul meaning no matter how long you spin, once 20-25 ul is achieved inside the filter insert, there will be no further flow-through. This is the lost volume for the sample. Typically, for the K572 assay, up to 50 ul sample per well can be used. For samples with small volume, the sample might need to be diluted with water for use with the spin filter. The PCA precipitation could be easier and will prevent any dilutions."